An anaglyph is a combination of two images into one, in such a way that they can later be separated by viewing the image through appropriately colored transparent filters. 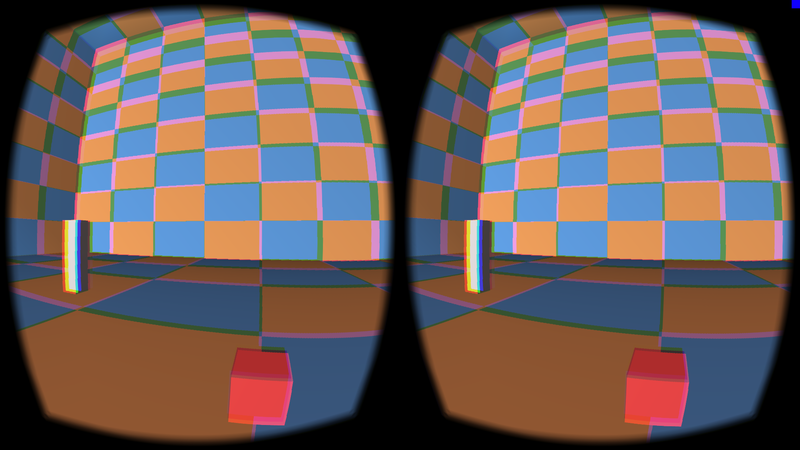 The objective is to present slightly shifted views of the same 3D environment to each eye, in order to achieve depth perception (i.e. really perceive the 3rd dimension). I’ve never dealt with anaglyphs in the past, but during my recent week-old obsession with stereoscopy, I’ve stumbled upon a pair of free anaglyph viewing glasses (made out of cardboard and cellophane of course). So I couldn’t help but try to find out how I can use them with my own programs. A long time ago, I stumbled upon a couple of strikingly odd images on Jim Arvo’s web site, which are apparently called “anamorphic”. 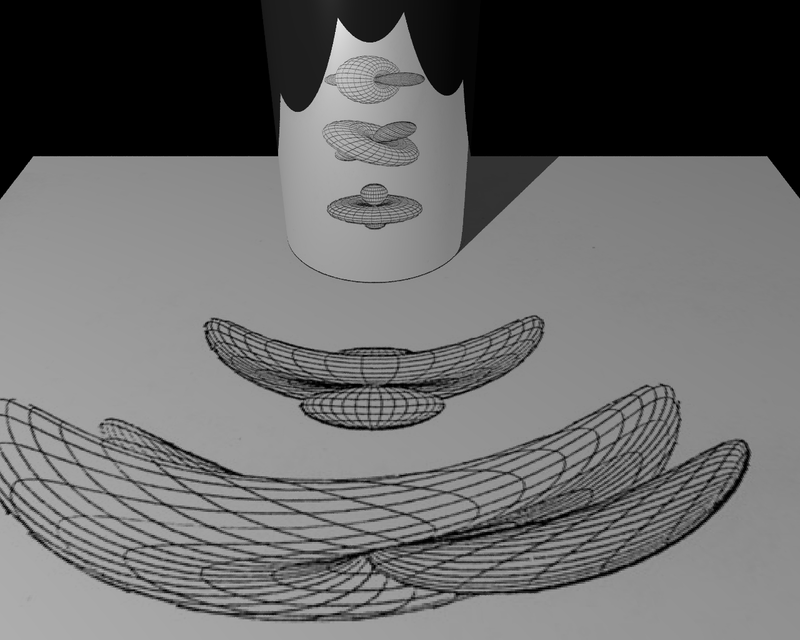 The idea behind an anamorphic image, is that it’s distorted in such a way, that its true shape can be seen only when viewed in a particular manner. In the case of these images, you’re supposed to print the image and place a highly reflective cylindrical object, such as a chrome pipe, at a specific marked location in order to see the geometric shapes correctly. 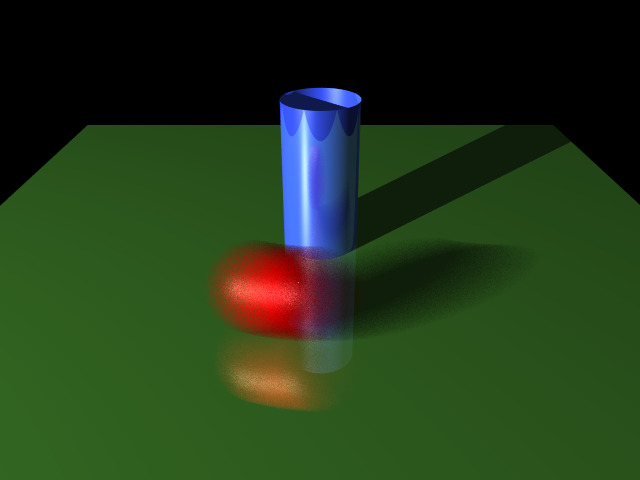 I kept the images back then, with the purpose of either finding an appropriate cylindrical object, or raytracing them to see what they look like, but for some reason I’ve forgotten all about them until I accidentally found them again yesterday, in a dusty corner of my filesystem. 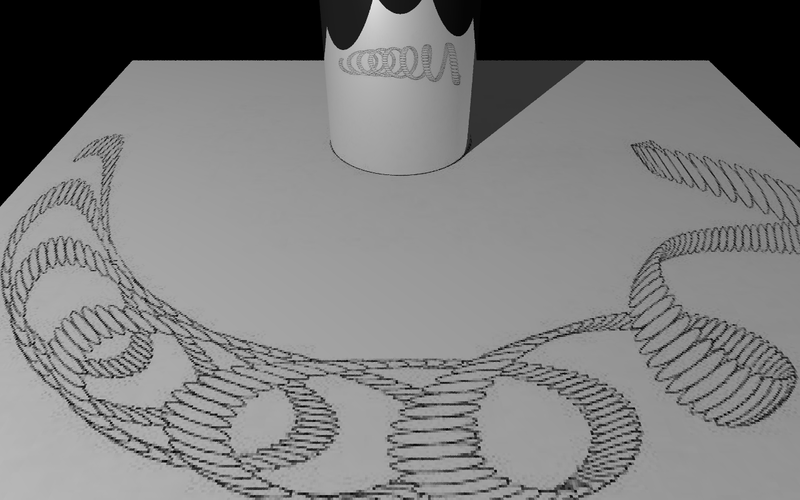 So I decided to hack some code to add perfect ( ) cylinder primitives to my raytracer and do a couple of renderings with those images texture-mapped onto a ground quad (I could just do the same thing with another raytracer such as pov-ray but where’s the fun in that?). I recently started writing a series of introductory tutorials about graphics programming with OpenGL, for the greek linux format magazine. The articles are written for the complete begginer, who hasn’t had any previous exposure to graphics programming. However, familiarity with the C programming language is definitely required. What I’m aiming for, is to thoroughly explain the underlying theory, in order to provide a stepping stone for someone who would like to eventually delve deeper into graphics algorithms, rather than just present raw examples for doing this and that with OpenGL. In any case, the first article of the series will be published in the september-october issue of the greek linux format magazine, which should be available during the next few days. Any feedback, is greatly appreciated.